My name is Claire Cummings and my colleagues refer to me as a trash-talking, waste-fighting garbage guerrilla. But my more formal title is Waste Specialist at the Bon Appétit Management Company, based in Palo Alto, California. As a major food service provider, we operate more than 500 cafes at corporations, universities, and museums around the country. One of my most pressing tasks is reducing post-consumer waste in our cafes. Americans in general have a problem with food waste. Yes, waste happens on farms, at grocery stores, and restaurants, but the food waste problem cannot be solved without consumer participation. To get and each and every one of us involved, I’m encouraging everyone to take the Scrap Bucket Challenge. Here’s an idea… Instead of focusing on the excess food that remains on your plate, let’s think about all of the food scraps collecting in our garbage bins (or compost bins, for those of you who are one step ahead of the rest) that could have been prevented. 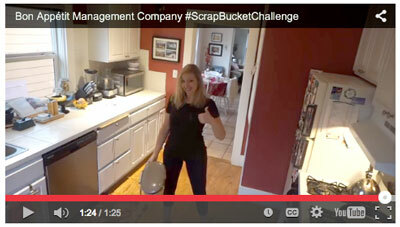 Do You Have What it Takes to Take the Scrap Bucket Challenge? So I’m issuing all of you a challenge — the Scrap Bucket Challenge. Similar to the “Ice Bucket Challenge” the idea is to raise awareness of food waste by recording yourself dumping food scraps on your head. The idea for the Scrap Bucket Challenge was born at the Zero Food Waste Forum, which was the kick-off for a national movement to end food waste in the United States. Since the challenge was first issued, some high profile folks in the waste world have taken the challenge, including Dana Gunders at NRDC, Jonathan Bloom (author of American Wasteland) and Jordan Figueiredo of EndFoodWaste.org and Feeding the 5000 in Oakland, CA. Just grab a week of collected food scraps, film yourself dumping the bucket on yourself (you can keep the video short and make it extra goopy for dramatic effect), upload your video and attach the hashtag #ScrapBucketChallenge. Search this hashtag on twitter, YouTube, or Facebook to find more.So what are you waiting for? It’s easy to take the Scrap Bucket Challenge! Check out Ben Simon from the Food Recovery Network and Joseph de Leon of Compost Coalition in Austin, TX each dumping multiple buckets of compost over their heads without any fear! Food waste is one of the most hidden but solvable environmental issues of our time. What a better way to pull back the curtain on food waste than by collecting our food scraps, taking a good hard look at what we are wasting, and then dumping it on ourselves? Well, perhaps we could think of a few alternatives but, come on, this is a fun one! The Scrap Bucket Challenge could dramatically shift our collective view of food waste. Our Bon Appetit team has taken the Scrap Bucket Challenge. Will you? Jacquie Ottman, founder of WeHateToWaste.com has taken the Scrap Bucket Challenge — and you can, too! 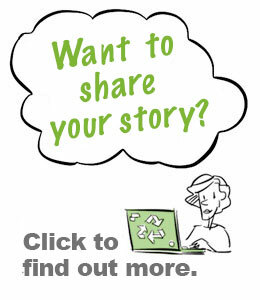 Posting Guideline – Stories published on WeHateToWaste.com are intended to stimulate productive conversations about practical solutions for preventing waste. 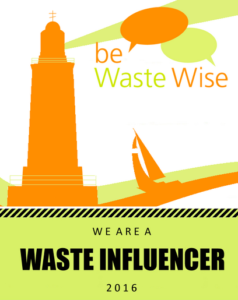 Information provided and opinions expressed are solely those of the contributors and implies no endorsement or guarantee by WeHateToWaste. Claire’s passion for sustainable waste management began when she was a student dining at Bon Appétit's café at Lewis & Clark College in Portland, OR. 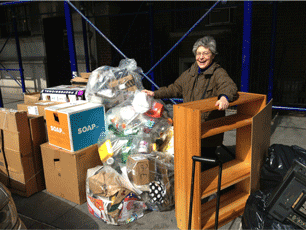 Her work as a Fellow for the foundation led to the creation of the Waste Specialist position. Over the past year Claire has doubled the number of Bon Appétit’s food-recovery programs, developed implementation guides for launching reusable to-go container programs, supported the development of a new kitchen-waste-tracking system, and helped launch the Imperfectly Delicious program, which has rescued more than 10,000 pounds of produce from going to waste on farms in the first few months of its limited pilot operations. So we are proud here at WeHateToWaste.com to support the #ScrapBucketChallenge, and hope that readers will jump in (or shall I say ‘under’?) As soon as I get back to NYC (from a great week in LA for the US Zero Waste Business Conference), I’ll be saving my own scraps, so stay tuned. 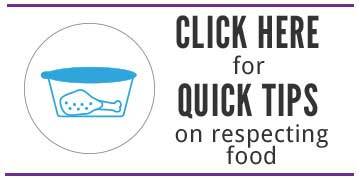 We ALL need to get “under” the #FoodWaste saving tent (or shall I say bucket)? Claire, you’re on! I did it! 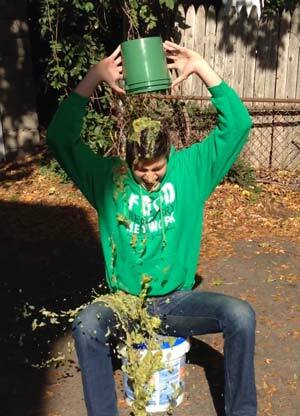 I took the #ScrapBucketChallenge — you can view it at our Facebook page, http://www.facebook.com/wehatetowaste. It really made a difference! I separated out my compostables all week, got to see what a week’s worth a kitchen trash looked like, and the whole challenge thing was fun (and not tooo messy!). Most importantly, it got me thinking about why it’s important to reduce food waste and what we could do about it in order to make a difference. That’s why I challenged Tom Vilsack, head of the USDA, Mayor Bill deBlasio of NYC (where I live), and Dan Barber, the Sustainable chef and author of The Third Plate. Can you imagine what would happen if we got these three influential men behind this movement. (Hint: it would move forward!) (and of course, lots of grassroots support bubbling up from the bottom is super important too! I love the idea of the Scrap Bucket Challenge. We all saw how effective the Ice Bucket Challenge was and all the conversation it generated. These kinds of conversations typically happen around things like terminal illness like we saw with the Ice Bucket Challenge, but very rarely about issues like food waste. The Scrap Bucket Challenge really makes this issue more visible (mostly because we end up wearing our scraps!) and will hopefully encourage people to look further into the problem of food waste. One of the most important components of preventing waste is influencing others to get involved and take a stand. What better way is there than challenging our friends and family to something fun like this? This is a great idea! I mean the ice bucket challenge worked really well. Unfortunately, (or fortunately) I’m not collecting food waste right now. I’m living on the road so what I buy goes into my stomach, not the trash. If I was cooking more from scratch I’d be able to. Unlike the ice bucket challenge thought it requires getting “dirty” not just cold. It will be interesting to see how much it catches on. 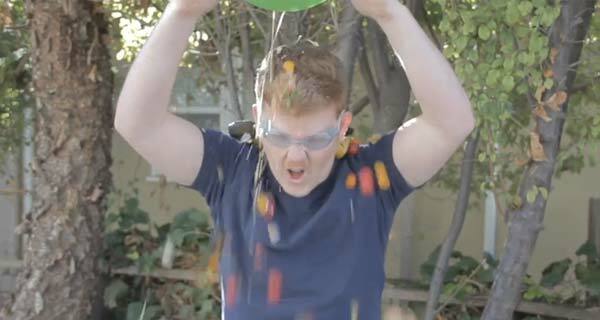 I think we should try to get #ScrapBucketChallenge trending on Twitter. This is such a good idea! It’s taking waste mitigation past composting and trying to eliminate the problem completely. Some of those statistics were real shockers to me – 40% of food we produce in America doesn’t get eaten! If there’s one thing I have to waste, it’s perfectly good food! Great Idea! Something everyone can do at home and allows people to get exposed to the serious issue of how much food we waste in this country. Great Cause, Great Movement, Take the Challenge and have some fun nominating some people! This has to become a thing like ASAP! No matter what, if you want to make a change for your cause, you WILL have to get a little dirty along the way. My mom would not be the biggest fan of me doing this in my kitchen but hey…totally worth the mess to get the message across. Maybe then I can get her to finally start composting.